Autocab, the global leader in taxi booking and dispatch systems technology, today welcomed John Miller to its national sales team. Mr. Miller will take up the newly created position of Sales Manager (New Business) with a remit for new business development in Southern England. In the role, John Miller, who has 20 years industry experience holding senior positions at Raywood Communications and, latterly, Cordic Ltd, will oversee the regional sales effort to ensure that both established customers and those who are just coming on board can take full advantage of the most powerful booking and dispatch solutions available. 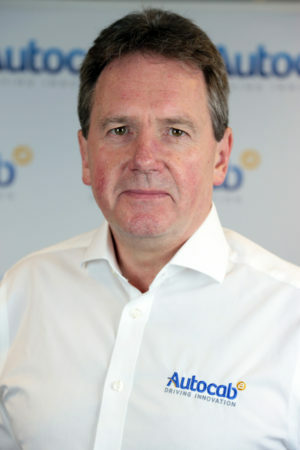 As the UK’s largest taxi industry technology provider by number of customers, geographical spread and number of vehicles using its booking and dispatch systems, Autocab is taking significant steps towards its plans to consolidate its position with continued investments in customer support infrastructure, research and development, processes and people. Having sold their first system in 1991, Autocab has grown to become the largest supplier of taxi systems in the world today. Their bespoke cloud-based SaaS solutions help power over 1500 companies across the world. Over 25 years of taxi company-inspired features have been built into our system to ensure it is the best booking & dispatch system on the market. Headquartered in Manchester, UK our customers are located all over the world. In addition to our flagship product Ghost, we have since broadened our range of services to include taxi company branded apps, analytics, bespoke phone systems as well as a range of web and social media solutions for private hire taxi and limousine companies of all sizes.